What's with the cat pictures? If you see pictures of cats instead of candidates, you've turned on Blind Hiring Mode. Blind Hiring Mode helps you reduce unconscious bias in your candidate evaluation by eliminating obvious indicators of race or gender. 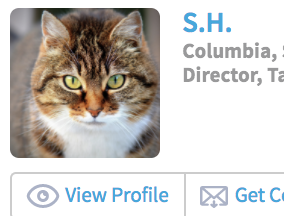 Candidate photos are replaced with photos of cats and candidate initials are shown instead of full names. You can toggle Blind Hiring Mode with the control above the main SeekOut search box.